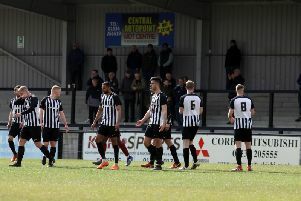 David Bell admitted he had sympathy for his Corby Town players after they were denied a much-needed win at Steel Park last night (Wednesday). The Steelmen looked to be heading for only their second success of the Evo-Stik League South campaign as goals from Phil Trainer and Sam Mulready gave them a 2-1 lead against Peterborough Sports. But the visitors snatched a share of the spoils thanks to Josh Sanders’ thumping header with just two minutes remaining to leave the Steelmen without a win in eight matches in all competitions. Boss Bell said the draw felt like a defeat and he conceded his team’s inability to make it 3-1 when the chances came about proved costly. “I said to the players afterwards that it felt like we lost the game, that was the feeling inside the changing room,” the Steelmen manager said. “If I am being completely honest, we thoroughly deserved to win. “At 2-1 we have had two terrific chances, Mullers (Mulready) has had a shot that has gone just wide and Jordan O’Brien is four or five yards out and hits the wrong side of the post and it goes wide. “They are key moments in the game but at 2-1, it’s not a nice scoreline. Teams are always going to put you under pressure, they will always have a 10 or 15-minute spell which they did. “We played well, the lads worked their socks off and I feel for them because we deserved three points. “We created chances, looked a right threat going forward and for 75 minutes we were in full control of the game. The Steelmen sit in 19th place in the early table and are now preparing for a trip to bottom side Market Drayton Town this weekend.